I am a foodie! Being a Marwari, our meals are not simple staple food and contains lot of accompaniments along with basic roti, vegetables (sabzi), dal (lentils) and rice. In my quest for personal fitness and wanting to lose weight, I initially struggled for few months. I kept wondering why am I not losing weight in spite of eating at regular intervals, not cheating, not eating out, limiting high fat foods intake, proper exercise routine, good 8 hours sleep and also resorting to meditation to remain stress free ? These questions kept lingering in my thoughts and one fine day my health expert analyzed my routine, my diet and figured that there were few dishes that I should be avoiding or limiting my intake on if I need to lose or maintain my weight. That’s when I found the solution and achieved the best results on this journey! I would like to share with you all about the most common 5 side dishes that people love, but, should be avoided or have it once in a while if you are on weight loss journey. Ahh!! That crunchy crispy papad. Rice and dal seem like an incomplete meal without Papad on the side. 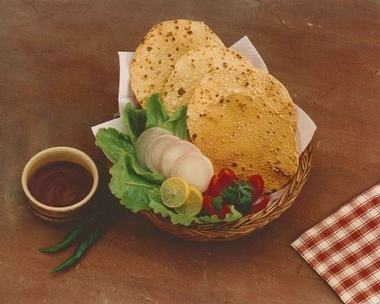 Papads can be deep fried–extremely unhealthy – or roasted – which is equally unhealthy! They can be made from rice, flour, potatoes or chickpeas and are mixed with a variety of spices, salt, and oil. An uncontrolled serving of Papad can amp your calorie intake and exceed your daily budget. The increase in sodium can lead to water retention, bloating, and constant thirst and may even cause an increase in one’s blood pressure. Since, most of them consume more Papad in one sitting…it may lead to acidity, and digestive problems too. When fried using same oil many times……the reused oil becomes transfat leading to cardiac issues and high cholesterol. When dry roasted, acrylamide is formed due to the presence of sodium benzoate. So, be mindful. A spoonful of pickle can spice up any meal. Infact I have seen people can take their meal only with pickles without any veggies sometimes. It works well with curd rice; adds a punch to Potato Breads (Aloo Paranthas), and makes Theplas (Breads made of various grains) the best dish to snack on! Pickles stand out as flavorful, low-calorie vegetables and is high in vitamin K. However, pickles are loaded with calories because of the oil they are preserved in and their nutrition content is almost zero, as the vegetables and fruits are minced and dried, which takes away the nutritional value. Like Papads, they are high in sodium due to the use of excessive salt for preservatives which might lead to hypertension if taken in excess. So Again the same funda…Eat in limit! Salad…salad and just salads!!! Most of the weight loss dieters say they are on some kind of only salads diet! But, still not losing weight? If you think having salads at the start of your meal will help you eat one less parantha, then go ahead and have a bowl. But, this salad helps only if it is not loaded with high-calorie dressings. Adding dressing to a salad can make the calorie content soar. Dressings such as Thousand Islands and Mayonnaise are loaded with calories, most of them fat. Stick to olive oil, lemon or low-fat yogurt instead! Salads are mostly accompanied with bowl of soup. And, one is right in thinking that a soup can be a healthy meal. It can fill your stomach and make you go less on other carbohydrate foods. But, if the soup is loaded with toppings such as cheese, cream, and croutons, it’s far from being healthy. Stick to clear soup with pieces of veggies and meats; shun all cream-based soups. And never pick up the soup sticks or dinner rolls that accompany your soup in a restaurant. That’s another side you don’t need! Go for more of homemade soups without any corn flour and also avoid packaged one as they are also high in sodium being added as preservative. Rather you can add oats flour as thickening agent.You can also opt for healthy cold soups. This curd based mixture is a hot favourite with most of us. Curd is high in protein, calcium, probiotic and the perfectly aid in digestion. It’s good to have curd daily for a healthy gut. The problem begins when you add fried snack to it. Boondi is nothing but fried globules of chickpea flour. The addition makes it a high-caloric food. When fried in reused oil, it becomes transfat and thus may lead to heart issues. So you can opt for veggies in curd or spinach, cabbage, pomegranate, carrot, cucumber, onion and the likes instead of a friend snack in curd. So be mindful with all these above foods and get fitter and healthier. Can you please tell me how to stay healthy with pickles.? Never knew these could have such impact. How to Break the Cycle of Adrenal Stress? Ashwin Chitransh Never Gave Up On Being Healthy!